Do you remember the Force Gurkha that was introduced as a limited edition vehicle for the off-roading enthusiasts? 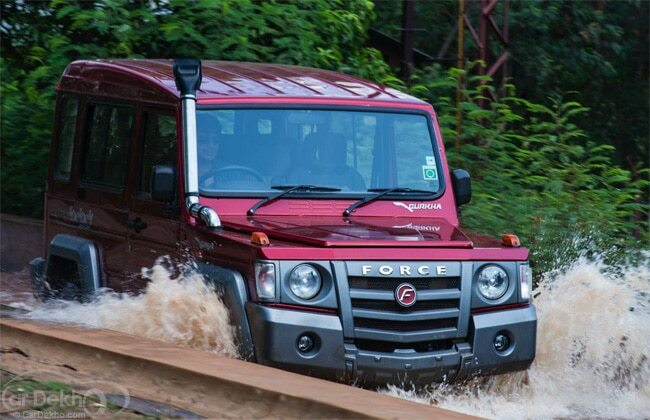 Force Motors has once again introduced the same product in its private vehicle segment, for those who love off-roading. The “Gurkha” moniker was given after the Gurkha regiment that has conquered all terrains and won almost every battle. The regiment is also a symbol of not giving up, even in the most difficult situations. Force Motors has once again introduced the “Gurkha” brand for the off-roading enthusiasts, and this will be on sale with the Force One in the personal vehicle division dealerships of the company. We lay our hands on this off-roading machine and take it for some severe off-roading track, built by Force Motors to show the capability of the vehicle. Read further, as we share our experience of the Gurkha. The new Gurkha’s fascia looks cuter than aggressive. The grey-coloured front grille resembles a smiley with round eyes formed by the headlamps. The grey coloured grille on the Gurkha has a different shade when compared to the cladding, which feels a bit of mismatch. The thick cladding that runs across the body, the side indicators mounted on the bonnet and the snorkel add the rugged look to the Gurkha. The side profile will remind you of the Gelande Wagen, as the Gurkha is based on the same platform. The door handles are old school style and they open and close too with a thunk. The rear is raised for a better departure angle and the spare tyre is mounted at the back. The Gurkha is available in three variants. One is the hard top that caters to the real off-roaders, who will want to travel with their family and friends and off-road. Second is the soft top with 4x4 options that is designed for purpose and show, while the third is the 4x2 open top meant for on-road driving only. The hard top is a five-seater with the second row having front facing seats, while the second row in the soft top is facing sideways. The Gurkha is designed for the off-road enthusiasts, and everything to adjust has been ergonomically placed near the driver than competition. The quality of materials used on the Gurkha is also better than the competition and so is the fit and finish of the materials. The controls for transfer case and the diff locks are placed next to gear lever for ease of use. The seats are also comfortable with good space for five people. The steering wheel is well weighed too, and the steering wheel size is also small. Our press demonstrator had a large wheel, but Force Motors has confirmed that the steering size on the Gurkha has been reduced for ease in manoeuvring. The Gurkha gets AC and the instrument cluster is simple with only a speedometer and fuel and temperature gauge. The tachometer is oddly located below the air-con vents and you do miss it most of the times. The Gurkha does have an upper hand with better quality interiors when compared to competition. The Gurkha gets a 2.6-litre direct-injection turbo diesel that churns our 80bhp of power at 3200rpm and produces a peak torque of 230Nm. The power might not sound too much, but Force Motors has ensured that the body weight of the Gurkha is less as it gets a tubular ladder frame, which doesn’t just improve the torsion strength of the material and is also lighter. The engine is noisy, however the power delivery is linear and smooth. The NVH levels aren’t that great, but its fine as it is meant to be quite and isolated. The five-speed transmission is rubbery and it does take some time getting used to early shifting. Also, the difference between the first and second gear ratio is much. It is easy to shift into four-wheel drive low and high with easy. Even the differential locks for the front and rear tyres are located close to the driver. Diff locks are only available Gurkha and no other vehicles in this price segment. The Gurkha has a ground clearance of 210mm, with an approach angle of 37 degrees and 34 degrees as departure angle. The short wheelbase of 2400mm adds on to the capability. We drove the Gurkha through different off-roading terrains, climbed uphills of about 27-30 degrees, when down a slope with 30 degrees angle. The front suspension has independent torsion bar and the rear has a live axle with leaf spring. The Gurkha is decent on the road, and it is fine to drive on the road to reach the off-road destination. The Gurkha does the job of driving on the on-road, despite being good off it. If need a comfortable off-roader with the must haves, the Gurkha is the ideal choice. Not only are the interiors good, but the hard top and air-con means you do not have to suffer in the Indian summers. Also, it has differential-locks that goes missing on the competition. The Force Gurkha is perfect mountain goat under Rs 10 lakhs price segment and this is our ideal recommendation for those looking to get one. As Force Motors plans to produce only 1000 in a year, so get one for your immediately if you are waiting to get one.